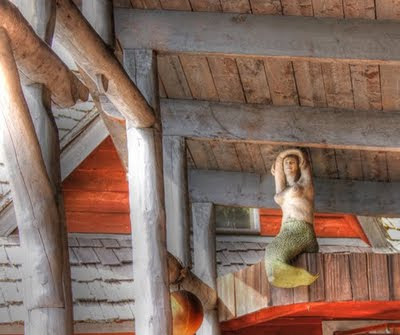 The Mermaid, hanging from the ceiling, at The Saltry in Halibut Cove. We headed out of Anchorage on Friday morning, and we pretty much got the jump on the fishing traffic. Places like the Russian River and Kenai River, as well as Deep Creek, were filling up though; I imagine the entire population of Anchorage headed south too. We stopped at the Sunrise Inn in Cooper Landing and to my surprise, The Skillet Lickers were performing that night, again. The last time I came through this was the case – back in May. Either The Skillet Lickers don’t get around much, or they really like Cooper Landing. We pressed on to Homer and got here with enough sunlight and day left to relax on the deck and soak up the rays. In Alaska, no matter where you are, the sun making a grand appearance on a cloudless day requires that you stop what you are doing and enjoy the moment. Quiet chatting, beer drinking, and relaxation went on for hours! The next morning, we headed out to the Homer street fair. This was the lucky weekend where all the artists and such get together and do a small fair. It took place behind the grocery store, not the high school like we had been incorrectly told. We then moved on to The Spit to catch the Danny J. across the bay to Halibut Cove. We boated past the bird rookery which was alive and well with gulls, puffins, and ducks. There were a couple of sea otters and seals, but mostly gulls. The bird noises were amazing and such a yammer. Once we landed at Halibut Cove, which is mostly a fishermen/artist community, we ate lunch in the sun at The Saltry and walked the decks and visited the galleries. Since Alaskans don’t get to see much sunshine, we tend to be clammy white and pale. So, when two days of sunshine appear in a row and we enjoy them, what happens? SUNBURN! Judy is now a lobster! We stopped at the Homer Brewery so I could pick up a growler of China Poot Porter. 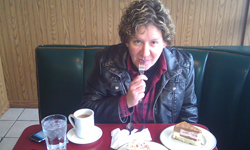 Friends in Anchorage we have six days to drink it – CALL ME! The evening settled into relaxation and more chatting and taking it slow. What a great way to spend the weekend. 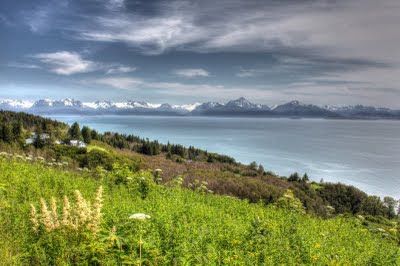 We head back to Anchorage tomorrow morning; I get a couple of days before I am packing to ride my motorcycle to Denali National Park. I will have a loop to Fairbanks for next weekend, and a nice drive back down the Richardson Highway, instead of returning back on the Parks Highway and Denali.